Mario Kuster, mechanical engineer at CREALET, answers questions about the current challenges, about trends such as Industry 4.0 or the Internet of Things and the positioning of CREALET in the global textile market. 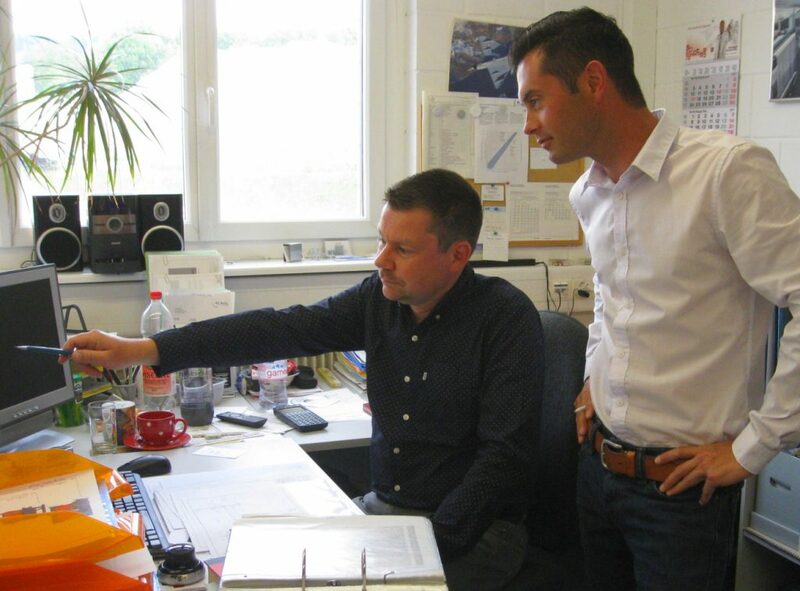 Mario Kuster (left) and Andreas Wirz of CREALET discussing a new product design. Mr. Kuster, you and Andreas Wirz form the second generation at CREALET AG and for about a year now with more responsibilities. From your today’s perspective: what are the three biggest challenges for the new management team? Mario Kuster: First of all, let me briefly clarify: the management is currently still in the hands of Walter Wirz and Leo Kuster. Andreas and I are primarily responsible for the development of new products. The two of us constitute the research & development team inside of CREALET, so to speak. A: To recognize the market needs of textile and fabric manufacturers at an early stage and to launch innovative products accordingly. B: New manufacturing methods – such as additive manufacturing – are among the most important development trends. We keep an eye on these developments and apply them to suitable applications. C: Industry 4.0 and the Internet of Things are other important challenges that we must face. You mentioned it: there is talk everywhere of “Industry 4.0”, the “Internet of Things”, “Big Data” or even “Smart Devices”. CREALET has been a world leader in the electronic control of feeding systems in the textile and fabric industry for many years. How do you react to these “mega-trends”? You’re right, there’s a lot of talk about industry 4.0. Of course, we are keeping a close eye on the latest developments and the new digital possibilities. As a solution provider for weaving machines, we equip our control systems with corresponding bus systems (e.g. CANopen) as a standard, much as it is mainly used in automation technology. Today, we can implement solutions that precisely and quickly synchronize the yarn tension of different warp beams and couple them together in an intelligent system network. In addition, our drives have integrated safety and comfort functions which, in addition to functional safety in the overall system network, also include communication and diagnostic capabilities. This also enables measured value acquisition and signal processing in the context of a comprehensive overall process. But weaving machine manufacturers are also called upon to find the right answers to these trends. Let’s switch to the customer side. The components of CREALET are used on all continents, by large and small producers, for large productions up to individual pieces in the high-tech industry. How do you assess the reaction of your customers to these digital trends? In conversations with weaving companies I often hear a certain distrust of these technologies. Reports of attacks, of errors during operation through manipulation of the power supply or through the targeted introduction of disturbances. Such reports understandably raise concerns with many customers. I prefer to speak of “awareness.” And that is certainly important in this context. In other words, a great deal of discussions will still be needed to further strengthen the confidence in IoT solutions. My approach: First of all, we need customer acceptance for such solutions. Secondly, the framework of the solution must be suitable for the intended application. In other words, only as much as is actually necessary and practical for the intended production. This also makes it easier to control security risks. As a Swiss company, you have successfully reacted to the currency situation since 2015 and even strengthened your position in the international market despite unfavorable conditions. How did CREALET manage this? Our good reputation, which has been built up over the past few years, has primarily ensured that we were able to master this difficult time successfully. Secondly, the partnerships have been partially refocused. It has not always been easy. Among other things, we decided to procure certain production parts more cost-effectively. This means that certain parts of our systems are no longer manufactured in Switzerland. On the other hand, the changed situation also allowed Swiss suppliers to offer us better conditions in certain areas. And third, we had anticipated the currency adjustment early on and had already expanded and improved our communication with customers, the network of agents and the media starting in 2014. This has certainly borne fruit in regard to our level of exposure in the market. All this has actually had a positive effect, also for our customers. We were able to expand our product range, both at product and service level. Mario Kuster (mario.kuster@crealet.ch ) joined CREALET AG in 2007 as a mechanical engineer. During this time, he has developed engineering projects for the automotive industry as well as for the supply of carbon fiber from creel to the weaving machine.